The other day I passed by a News truck and it got me to thinking. 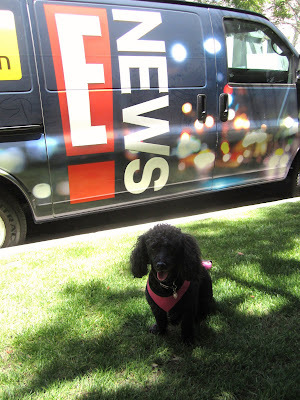 Maybe I should be a reporter. I am very interested in what is going on in the world and also love to share with the world. So it would be very similar to blogging, just on TV. And since Rosy was such a good guest reporter for me, she could do celebrity features. I could start reporting for Good Morning Memphis with the vision of creating and anchoring Good Morning World. Since it got so hot over the weekend, we got to go into the pool. Mom tried taking Rosy in, since she didn't want to go in herself. But she went right back out. Then Mom tried to entice her with a tennis ball. I kept trying to show Rosy how much fun it was to fetch in the water. But Rosy did not want to go get the ball. She just waited till it came to her. I asked her why she didn't want to swim. She said she doesn't like the way her hair looks when it gets wet. Ugh. Girls! Today is the 100th Anniversary Indy 500 race. It got me to thinking, what if I were a race car driver? I am in awe of Helio Castroneves - three time winner. Rosy is interested too. 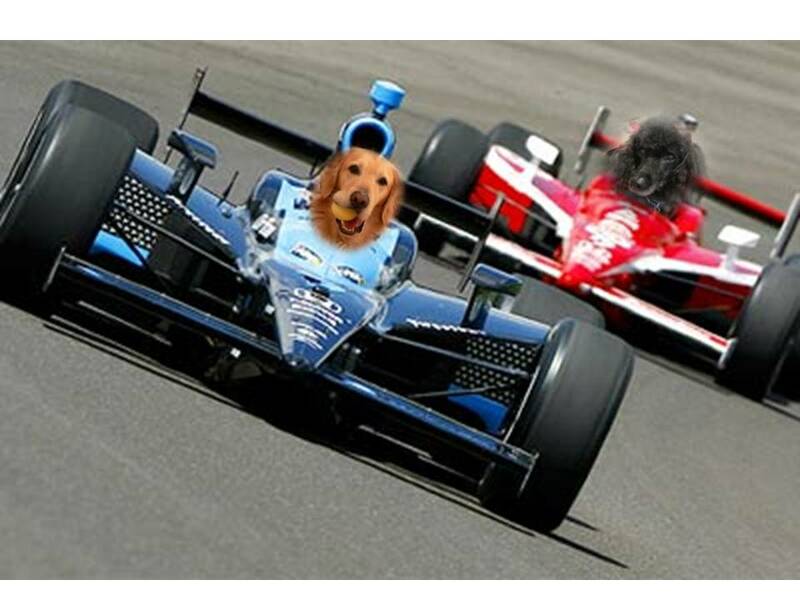 She is very inspired by the four women in this year's race, especially Danica Patrick. Well Rosy can be Rosica, and I can be Beario. Not only would we get to drink milk if we win, but then we could be in a commercial or go on Dancing with the Stars! 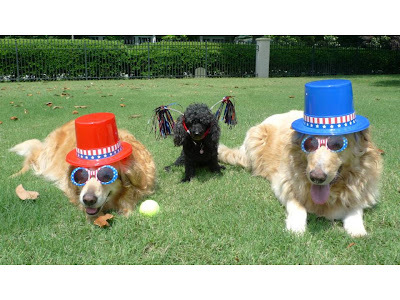 Its Memorial Day weekend! Memorial Day honors US soldiers. So we want to thank and pay tribute to all the soldiers that have given themselves to protect our country and freedom around the world. And we would also like to thank whomever made this weekend known for barbeque. Dad has already promised to fire up the grill! 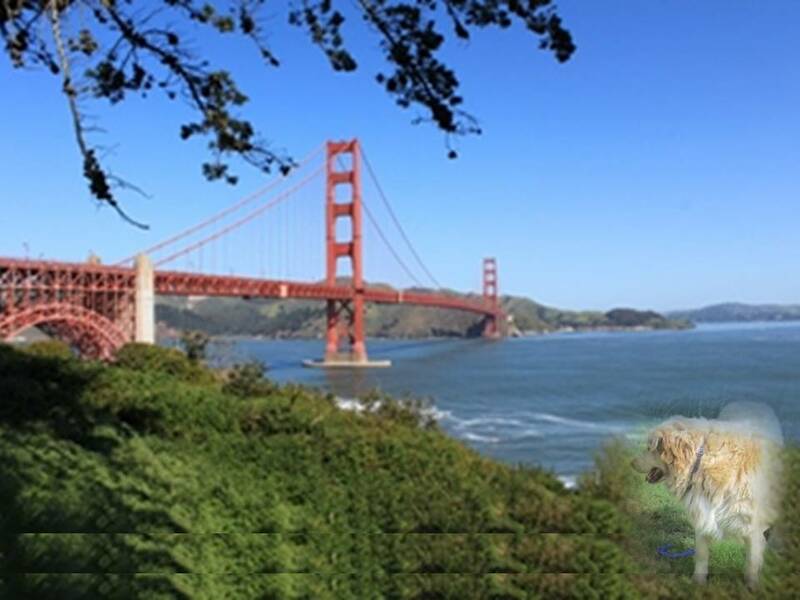 Bear asked me to report on the Golden Gate Bridge's birthday. It was opened on this date in 1937. 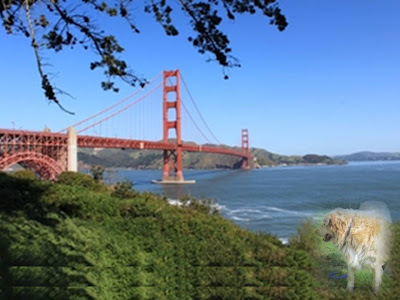 It is one of the most beautiful bridges in the world. The website explains things to do: Biking, Walking, Shopping, Learning, Snacking. Well, Mom and Dad maybe would want to bike. Mom would also want to do shopping with Rosy. Dad and Bear would want to learn. Of course that leaves snacking for me, my favorite past time. I did not mention walking, cause dogs are not allowed to walk across the bridge. So how are we supposed to get across? 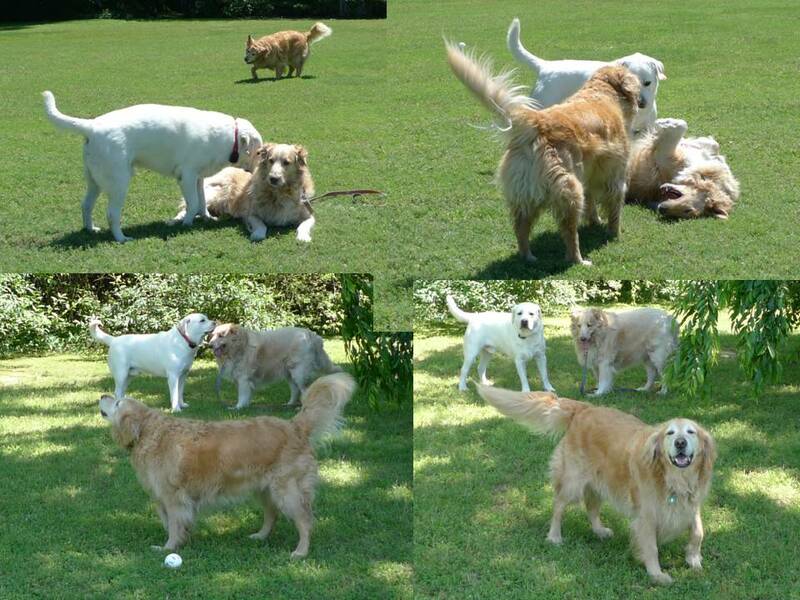 Bear said maybe since we are Goldens, they will make an exception since it is our namesake. I really love flowers. I think they are so pretty to look at and sniff. 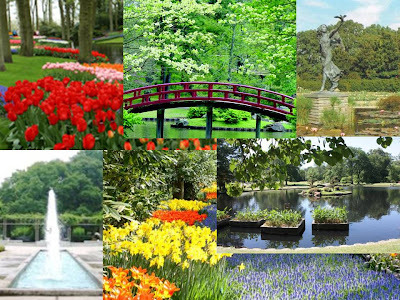 I wish I could go to the Memphis Botanic Garden. It's supposed to be one of the best in the US -96 acres with 23 gardens. They even have a kids garden called My Big Backyard that offers a place for jumping, splashing, digging, creating and discovering the joys of time spent outdoors. Now that sounds absolutely perfect for me. But as usual, I , a dog, am not allowed to enjoy. I just don't get it. How am I supposed to become a well rounded cultured canine if I am not allowed into any of these educational venues?. The other day Rosy asked me if we could go to Starbucks. I asked her how does she know about Starbucks? She told me when she was in California, she and BunnyBell grabbed a Starbucks and went for a chat in the park. I told her Memphis is a bit different than California. Here, we should go and grab some barbecue. She liked that idea. Today is Bob Dylan's 70th birthday. He has been a music icon for five decades! He was born Robert Alan Zimmerman. But inspired by poet Dylan Thomas he just called himself what he wanted to be called. How cool! That got me to thinking what it would be like if I called myself Bear Dylan. 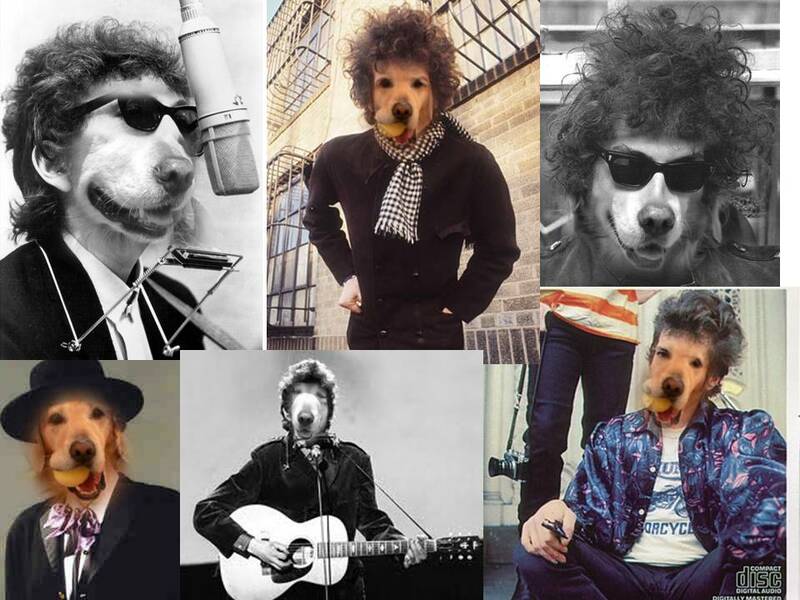 I wonder if I could write and record songs like Barkin' in the Wind or Like a Rolling Bone. Hmmm. If I can blog, why not song write? I think I will ask Mom for a guitar. One of my favorite stories is Pinocchio. I can so relate to him wanting to be a boy. In order to become a boy, Pinocchio had to be Brave, truthful and unselfish. Well, I never lie so I wouldn't have a nose growing problem. That's good. And I think as I have matured I have become unselfish. For instance, even though I was here first, I share my toys and my Mommy with Fuzz & Rosy. So that brings me to brave. I have always been known as a "sensitive guy" because a lot of things make me very anxious and scared. Visits to the vet for example. And those tornadoes don't bring out the bravery in me. OK, so I still have work to do before I am Bearnoccio. This weekend my human bro graduates from college! Humans make graduation such a big deal that it got me to thinking. What must it feel like to be a graduate? I guess it must be a big feeling of accomplishment. And a relief that there is no more homework. And I guess it means that you will soon be leaving home to be on your own. Leaving home? No, I don't want to graduate. Bear and I are always discussing how we dont get to see the world since we are BIG dogs. So I suggested to Bear that we rent an Autogyro. He thought it was an interesting idea. 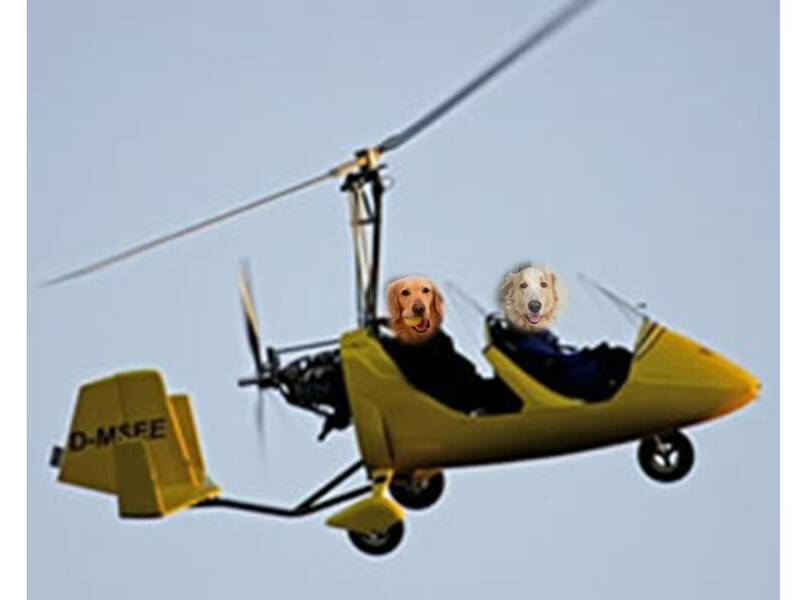 I told him since I thought of it, I would be the pilot. He said we would take turns but I could go first. I thought that was fair. He told me to do some more research on the viability of our venture and report back to him. Off to my assignment. On April 14, I did a post about Dogpolean. Yesterday, I finally met him and he agreed to a meeting with me and Fuzz. His name is actually Max. That is short for Maximillian. (So I wasn't so far off with Dogpolean!). Anyway, he acquiesced that he would just rule his house property and not the neighborhood. 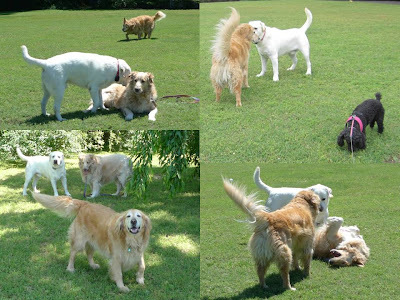 And since we are all retrievers, we decided we could call ourselves Retriever Rulers. 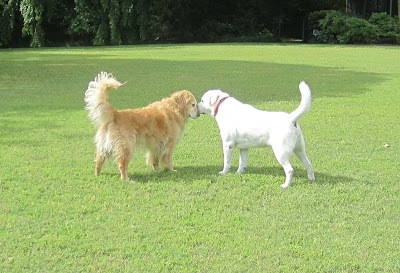 So all retrievers in the neighborhood (there are a ton) can join. Rosy felt so left out. So she anointed herself Queen Rosy. She said she rules the retrievers. Great. So now its Rosypolean. Rosy and I were discussing tonight's finale of America's Next Top Model (ANTM). She showed me a picture of when she and BunnyBell (my niece) were making believe they were on ANTM by doing a photoshoot. They copied BunnyBell's mom's pose from Regard Magazine. BunnyBell even turned her head like her Mom. So now Rosy and BunnyBell want to try out for next season's show. Rosy asked whether I would root for her or BunnyBell. UhOh. I just found out that May is National Hamburger month. 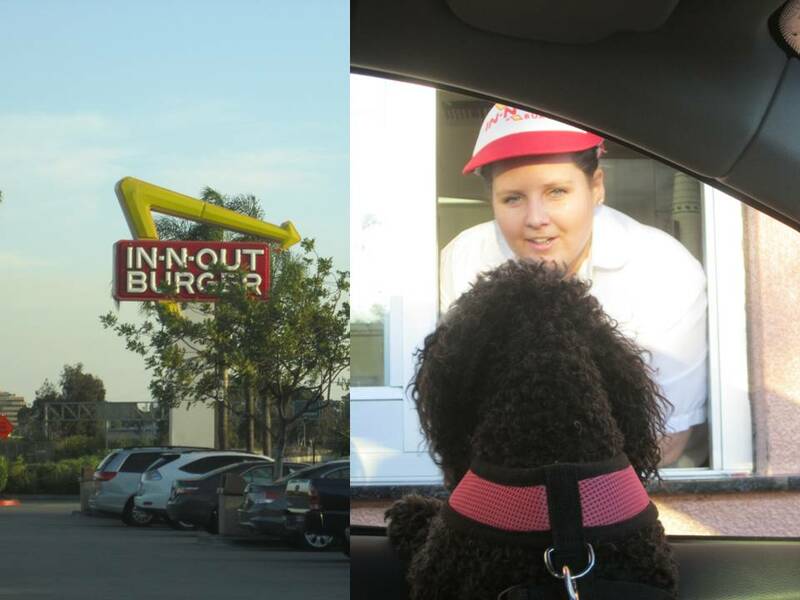 Rosy told me that she celebrated in California with In-N-Out. I was so jealous! That is my favorite hamburger restaurant and they dont have any in Memphis. I wonder if I could have an In-N-Out Memphis franchise. I will do that research at the same time I look into my Pizza franchise. SO many business opportunities! Mom came home from a store yesterday and was so excited. She said we can all play a new game together...Horseshoes. She brought out a bag and I didn't see any horses or shoe boxes, so I was a bit confused. But then she took out the spikes and the horseshoes and explained the game. I told her we don't have thumbs so we can't pick up horseshoes. Mom suggested that we pick them up with our mouths. That is when Rosy turned around and Fuzz walked away. And there I was. I guess I need to practice. 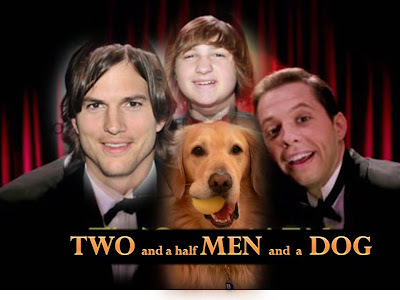 I heard they picked Ashton Kutcher to replace Charlie Sheen. But it got me to thinking. Why not have me replace Charlie Sheen? It would be a lot cheaper! I could be a swinging dogelor. And me living in a beach house is totally believable. Fuzz says its not going to happen since Ashton already signed the deal. 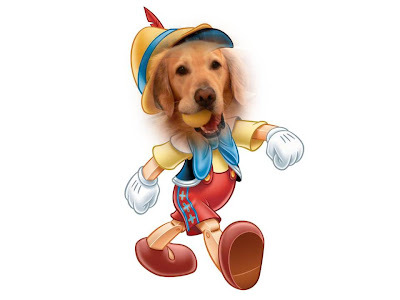 OK, so what if I came on as Ashton's dog! 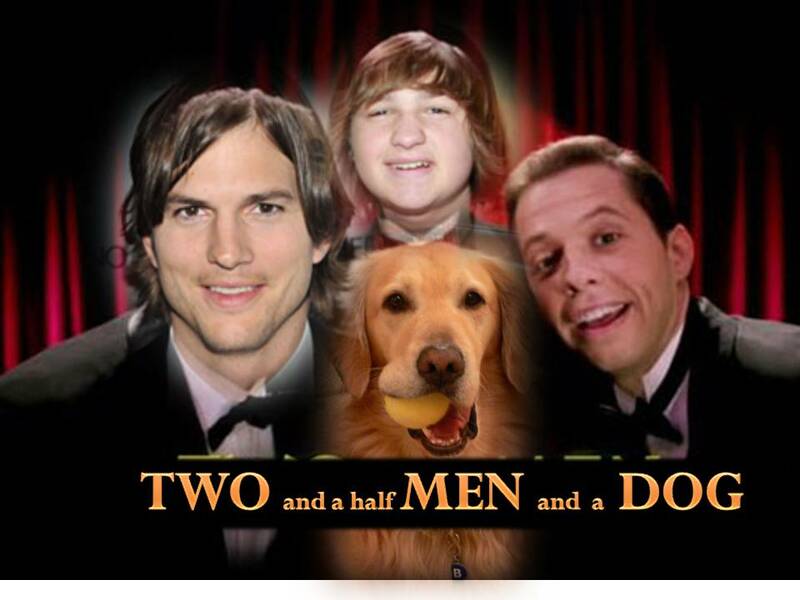 Two and a Half Men and a Dog! I think that is a perfect! The kid is getting older, so I could be the cute one! Don't you think it's a good idea? The other day the Gladiator movie was on TV. It got me to thinking what it must have been like to be a gladiator. So I asked Fuzz if he wanted to play Gladiator. Well Fuzz can just never be serious. And I, again, the pacifist, don't like to fight. So I guess we wouldn't make very good gladiators. The hats are pretty cute though. At least Mom thinks so. Last night I heard on the news that President Obama was coming to Memphis next week. He is going to give the commencement address for Booker T. Washington High School. I assumed I would not be allowed to go. So I guess that is what led to my dream last night. It seemed so real. 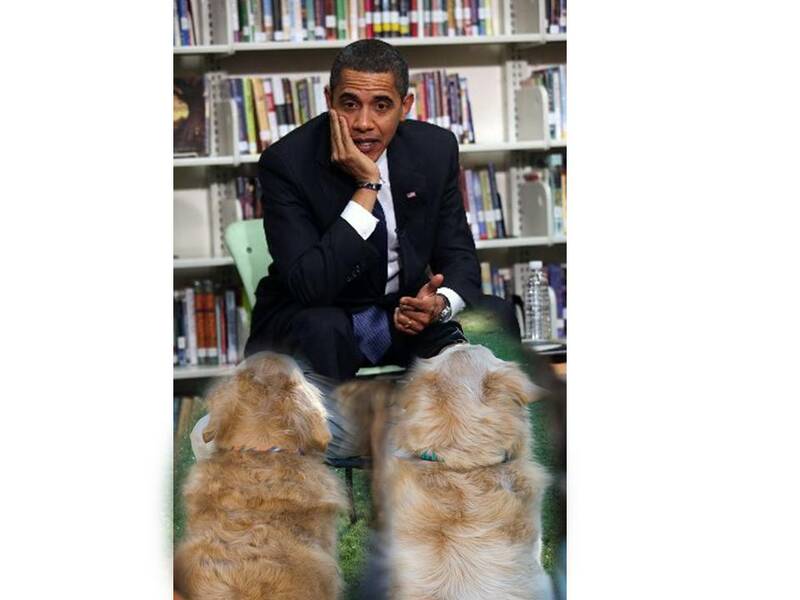 There I was with Fuzz having a private chat with the President. I was lobbying for dog access rights, like being allowed into the auditorium to hear him speak, or into the FedEx Forum to watch the Grizzlies play. 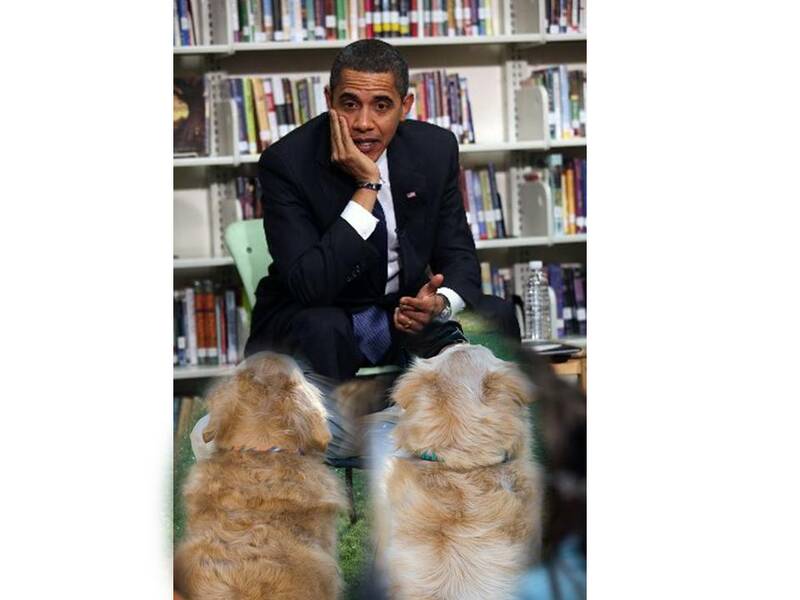 Fuzz asked him about the economy. That is when I knew it was a dream and woke up. I am not a hunting dog. However, I thought for educational purposes it would be good to try bug hunting. Fuzz didn't want to join me because he didn't like the hat. I wouldn't let Rosy participate because she would kill and eat the bugs. I saw her do it to a fly the other day. I, as Bear the BugHunter, will catch the bugs with my net, study them briefly and then set them free. After all, as a pacifist, I believe in catch and release. The actress Alicia Silverstone gave birth to a baby boy yesterday and named him Bear ! I was so excited to hear that. Maybe my name will be a new trend in baby names! Ya know, some refer to Ms. Silverstone as Clueless. I personally think she is brilliant. At least regarding her baby naming skills! So nice to have another Bear in the world. Welcome Baby Bear Blu Jarecki! Fuzz and I waited SO long for Mom to come home. We had an idea to create a big sign that she could see from the airplane. We felt our concept was great, but we weren't able to execute. So we got her welcome home flowers instead. She thought they were beautiful. 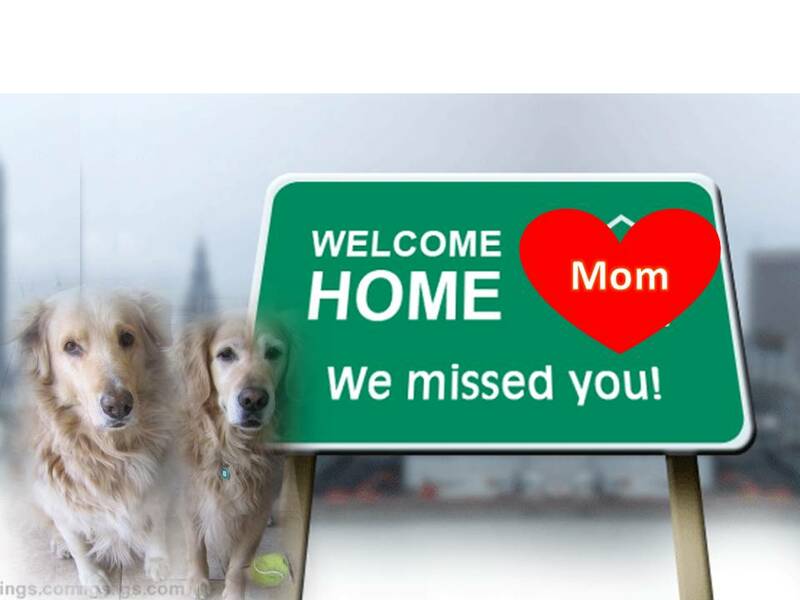 So yesterday was Mother Comes Home Day at our house. We are so happy to have her home. Oh yah, and Rosy too. Mother's Day is a big celebration day for me because I am very lucky to have my Mom. 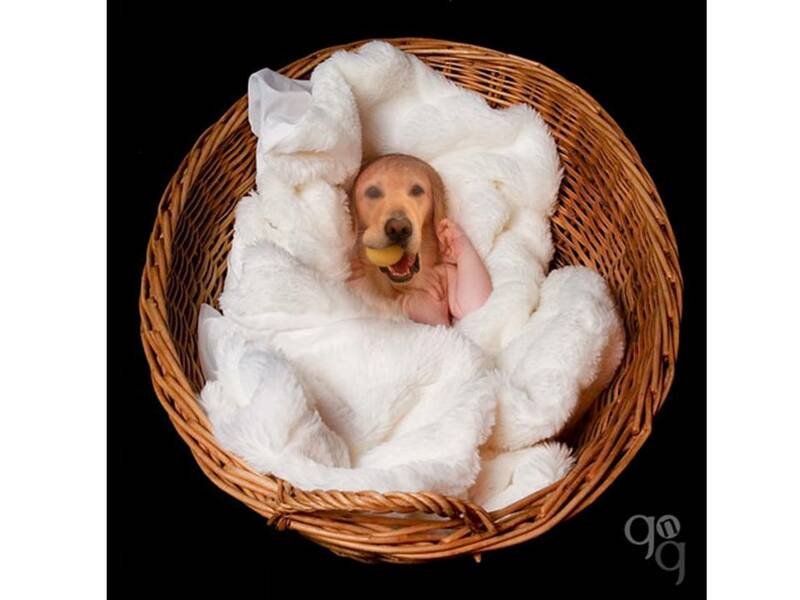 I am so grateful to my Mom for finding me, keeping me, and loving me. And I have been extra lucky this past week being able to have Mom all to myself on our vacation (that is not counting Sydne and Bunnybell). So it has been Mother's Week! Bear says he celebrates Mother's Day everyday. I will join him and clink my waterbowl to that! Here's to you Mom! I love you! Just when I thought it was time to settle in after dinner and watch TV, Mom said "let's go to the beach!" I was thoroughly confused. We had already had a day of beach and it was late. But I am up for anything on this trip since it has all been good. We all walked over to the beach and looked at the sun dropping into the ocean. Another wow. I am really going to miss this place. I changed my mind. Well it is a woman's prerogative you know. I don't mind the water at all. In fact I had a blast yesterday at the beach. Mom threw a tennis ball and that is when I felt the Bear in me. I ran right after it and played fetch until I was exhausted. I even went in the water when there were waves over the ball! Bear was right. The beach is great, even though it requires an immediate bath at days end. I just wish Bear could be with me. Before I left for California, Bear strongly recommended playing in the ocean. So I took his bark for it and I let my Mom take me in. Can he spell FREEZING! And does he not understand waves for a 12 lb dog? Hello? Well, that is not happening again. 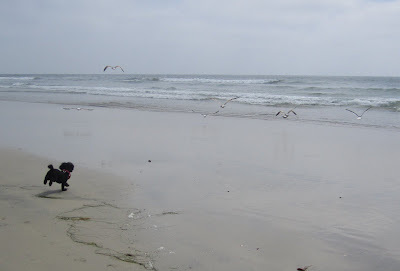 The ocean can touch my feet but that is about it. However, I don't know why he did not tell me about bird chasing. Now that is a fabulous beach sport! Yesterday, we took a very long walk on the beach. It was really windy. BunnyBell thought maybe we could figure out how to get back without walking another couple of miles. She suggested maybe we could fly. She said if I run real fast, my ears might propel me up. and then she would jump on my back. I told her that she was delirious from the sun and anyway, I like walking. After a two hour drive south from Los Angeles, we arrived in Del Mar. Mom told me this is where Bear used to live. Wow, it is so pretty! Then she showed me dog beach. 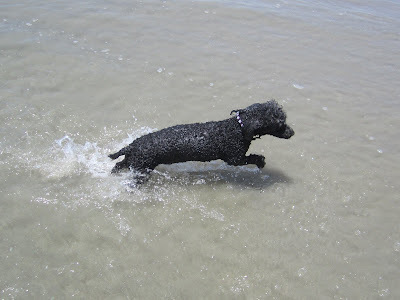 All the dogs get to run and play off leash and go in the ocean. Another wow. She said we will be going to the beach soon. I am very excited. Not sure about the ocean though. We'll see. This is such an inspirational place to blog! No wonder this is where Bear started blogging! Mom and Dad took me to Runyon Canyon, this wonderful place to walk. They used to take Zack & Oliver there all the time when they lived in L.A. It is one of my Mom's favorite places in the world! It is like walking on top of Los Angeles. 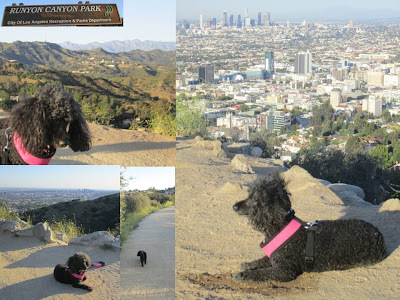 At one point, you can see the Hollywood sign when you look left, the whole West side and downtown when you look straight and the ocean to the right! And did I mention the dogs! So many dogs and they can be off leash (except me!) I am really starting to like L.A. It figures, now I need to leave! Something totally new for me on this trip that I love is going to outdoor cafes. They are very popular in West Hollywood. Each time I went, Mom gave me tastes of her food. I walked with her to Melrose for breakfast and lunch on the Sunset Strip. 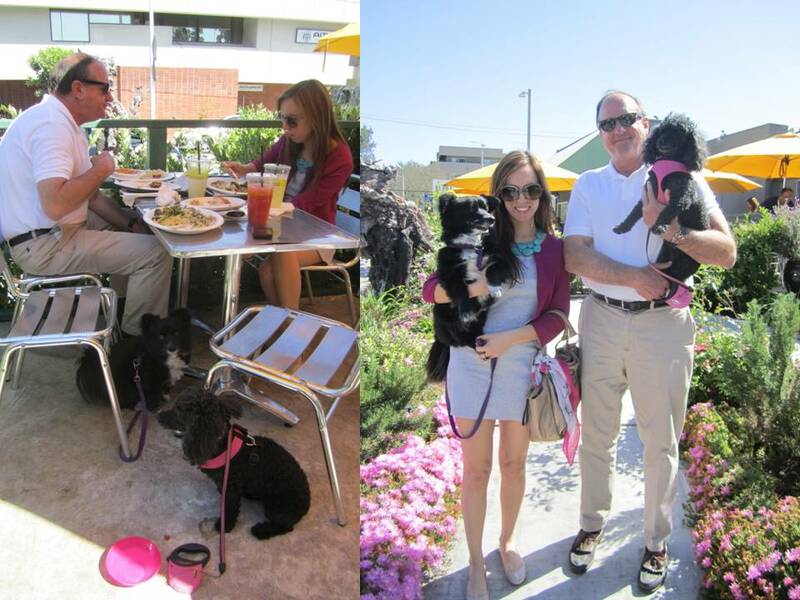 Then another day we went with Sydne, BunnyBell and Dad to lunch at Lemonade in WeHo. I hope to start doing this Cafe activity when I get back to Memphis. However, somehow, I dont think it will be the same vibe. Not sure if it that is because of the rain, the heat, or the fact that Fuzz would also have to come. First note, that the only shopping I have ever experienced was my at my local pet store and PETCO. 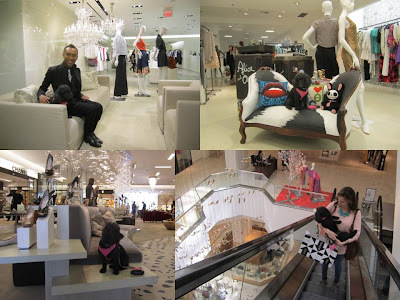 So I was a bit overwhelmed when Mom and Sydne took me to Beverly Hills. We went into this big fancy store. I thought it was a giant multi-story closet (much better than my Mom's for tornado warnings). I met Elgin, the "feel good style guru". I thought he would show me to the pet department but there was none. What's with that? 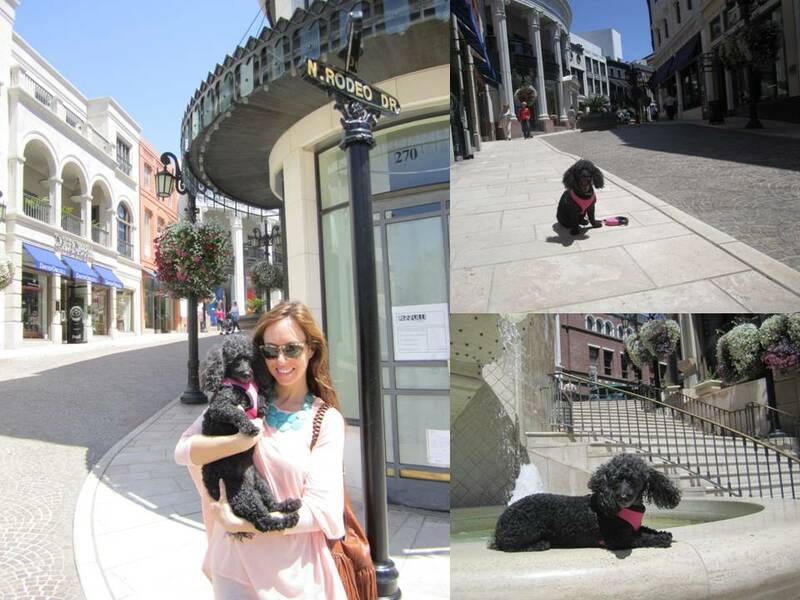 Then we went to see Rodeo Drive. I tried my fanciest pose, again, in hopes of getting discovered. Los Angeles is a BIG city, especially from my perspective.. a 12 lb Southern small town poodle. Anyway, when I arrived at LAX and drove to our hotel, I was a bit freaked at all the noise and cars, buildings and people. My Mom said "you're not in Memphis anymore Toto." Had no idea why she called me Toto. Anyway, in the room of our hotel I overlooked the Hollywood Hills. I have never been so high up and saw so much stuff! It was all a bit too scary. But I have to be brave if I want a chance to be discovered.